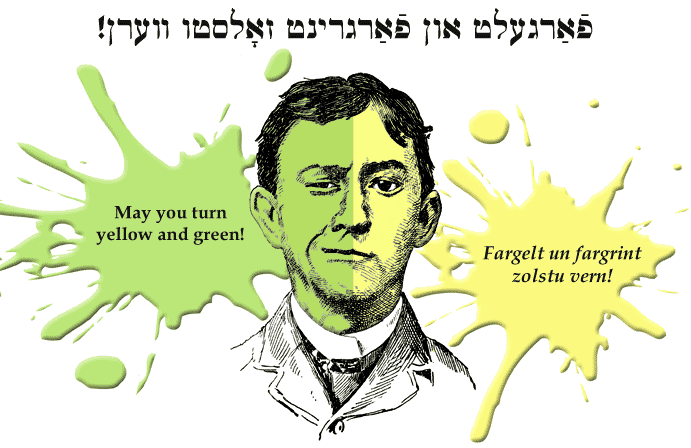 Yiddish Curse: May you turn yellow and green! פֿאַרגעלט און פֿאַרגרינט זאָלסטו ווערן! Fargelt un fargrint zolstu vern! May you turn yellow and green! SOURCE: Stutchkoff, Der Oytser fun der Yidisher Shprakh. Yosef Guri (Let's hear Only Good News) explains that this curse is used when someone asks for money, since the word fargelt (turn yellow) includes the word gelt (money).